One of the most important issues involved with the optical network is network management. Some of the important issues and features are briefly discussed in this section. Optical network management is done by using multiple layers (EMS, NMS) of management as shown below. 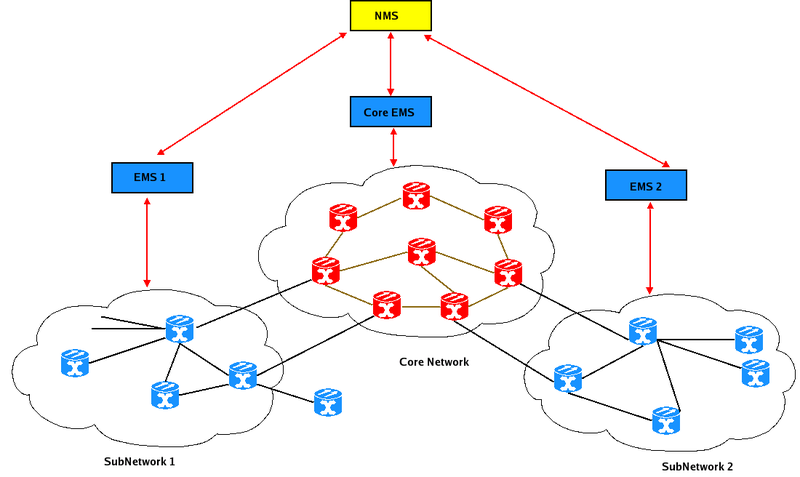 EMS (Element Management System) manages a subnetwork of the network elements. It typically provided by a network element supplier and capable of managing multiple network elements of that supplier. An EMS may communicate with one or more NE(s) on an individual or collective basis (e.g., individually to a switch or collectively to SDH ring). NMS (Network Management System) is responsible for end-to-end management of a network composed of network elements from multiple suppliers. Instead of directly managing network elements, it relies upon the capabilities of the EMS(s). An NMS may interface with one or more Service Management Systems and may include some service management functionality. An NMS may also include some element management layer capabilities that allow it to manage individual NE(s) or it may contain only network management layer functionality to manage one or more EMS(s). NMS talks to the EMSs to get the overall view of the network. Metro network: is a network that aggregates customer traffic and connects customers to services. The metro network is responsible for receiving network traffic from long-haul transport networks and routing this traffic to and from enterprises and end users. This entry was posted in EMS/NMS/OSS, NGOSS/OSS/J/TMF. Bookmark the permalink.